Swinging jazz clubs, world-class restaurants and the entangled history of the French Quarter illuminate your stay at Andrew Jackson Hotel. Discover all that New Orleans has to offer with our local guide. Lots of folks visit New Orleans in the summertime, and they’re quick to tell you how hot and humid it can be. However, outsiders seldom hear about what the winter weather is like in the Big Easy. Similar to other southern cities, winter temperatures in New Orleans are erratic, with a warm, 70-degree forecast one day and low 30’s the next. Cold snaps follow heat waves, which makes it tough to gauge your packing list. Not sure what to bring? Here’s a look at some packing essentials for your trip to New Orleans in the cooler months. As we mentioned, temperature swings are unpredictable. This goes for rain and sunshine, which is apt to change at a moment’s notice. Instead of packing clothes for warm and cold weather, your best bet is to pack layers. For ladies, this means jeans or a casual skirt you can pair with some warm tights; scarves and a light jacket. Men can pack a henley and a light jacket, just in case the temperature drops. Many establishments in the Big Easy are equipped with high ceilings, which helps to keep buildings cool in the summer months. This has the reverse effect when it’s cold outside. Bring a light sweater so you’re comfortable indoors, which can sometimes be a bit chilly. 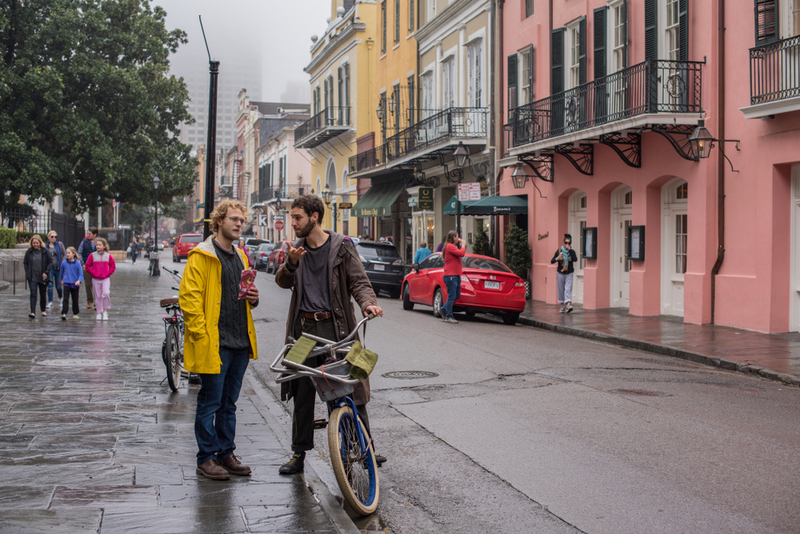 The French Quarter is best explored on foot, so pack comfortable shoes and socks. Also consider shoes that are waterproof or semi-waterproof for rainy weather. You won’t want damp shoes during your trip, especially if parades are involved. If there’s room, bring a second pair of sneakers. Whether it’s hot or cold in New Orleans, it’s just about always humid. The humidity tends to enhance the weather, so if it’s hot outside the sauna-effect will come into play; if it’s cold, the moisture will permeate your clothes to make you feel even cooler. Pack breathable fabrics in order to keep dry, such as cotton or activewear with polyester and nylon that enables wicking. New Orleans isn’t stuffy when it comes to dresscode - most establishments are casual. In jazz clubs and most restaurants it’s only normal to wear a pair of jeans, which works well against the elements. Dress a pair of jeans up or down in New Orleans, whether you’re sipping on drinks at The Spotted Cat Music Club or out for a day trip on the Mississippi River. What are you waiting for? Visit the most haunted city in the country this season. Check out rates at Andrew Jackson Hotel, located in the heart of the French Quarter. © 2019 Andrew Jackson Hotel®, a French Quarter Inns® hotel.